Rakusan did not include the Fan Series in his main sequence numbering. Therefore, the original number used for each of the 36 Series prints has been modified to identify the Fan Series members of its theme. The five different fan silhouette shapes have been here assigned arbitrary numbers 1 through 5. To indicate a fan design these shape designations are added to the 36 Series number separated by a hyphen. 127-1 is the Fan Series design with fan shape 1 in the 127 Shrimp and Clam theme. Like all other designs in this series, 127-1 was only produced in a single print run, and few copies are currently documented. Three of the five fan designs (including 127-1) have seal C which indicates a carving date during the first half of 1934. Despite the early completion of those wooden blocks, Rakusan delayed printing and distribution of the prints in what became the 127 Shrimp and Clam theme at least for several months. It was eventually grouped with other winter season themes nearer to the end of the series. One fan design (127-3) has seal R which is a rare minor seal whose carving period has yet to be established. The remaining fan design (127-5) and the 36 Series design 127 both have seal B which indicates a later carving period closer to the time of publication. The composition of 127-1 shows a view looking down into a clear mountain stream. The stream bottom is indicated by abstract dots for mud or sand, and by chips and gouges to suggest rocks. A long-clawed river prawns is accompanied by two small sculpins and four pieces of water-milfoil. 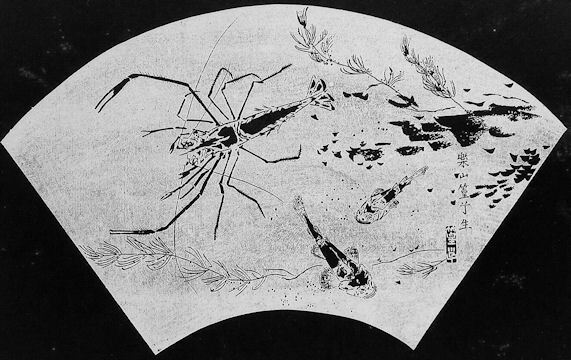 The technique is a combination of line drawing and solid areas which look equally well in the ishizuri version or in the original sketch. Oriental River Prawn, Macrobrachium nipponense, 草蝦, 手長蝦, 手長海老, てながえび, テナガエビ, tenaga ebi, lit. 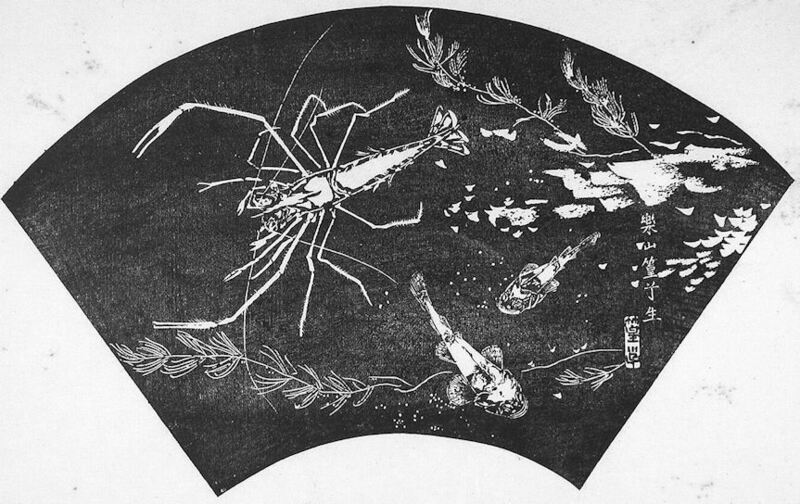 'long-handed shrimp', is a common freshwater shrimp which is also now widely farmed for food. Japanese Fluvial Sculpin, Cottus pollux , 鰍, かじか, カジカ, kajika, 'sculpin, bullhead', is a bottom-dwelling fish of mountain streams in Japan. Eurasian Water-milfoil, Myriophyllum spicatum, 穂咲の総藻, ほざきのふさも, ホザキノフサモ, hozaki no fusamo, is an invasive aquatic plant commonly used in aquariums. It readily escapes and naturalizes. It occurs in the background of several Rakusan aquatic designs.